"With the help of my faithful lieutenants I will bring those defenceless women safely to England according to my pledged word, then my arms will close again around you and you will feel my whole soul in a kiss." But it's been a matter of some debate whether our hero ever actually said it in any of the books. Gasp and horror, could it be he never said it?! Not 'sink me'! "The Cosy Corner"? It was anything but cosy on this bleak February evening when a hooded cart drawn by a couple of horses came to a halt beneath its creaking signpost. The man who had been driving it threw down the reins and jumped down from the cart. At the back, under the hood, there were two bundles wrapped in thick blankets. Live bundles, through the thick folds of which came the sound of whimpering and little human cries: "Maman?" The man went round to the back of the cart. With infinite precaution he took up the bundles and carried them into the derelict house. Through one room, which had obviously been the public bar once, he carried the two bundles one by one, and thence into an inner room, wherein, as there was no furniture whatever, he deposited them with tender care on the wooden floor. He saw to it that the blankets covered the small human forms efficiently against the cold, and listened for a moment or two to the pathetic cries of "Maman." He then took a bottle out of the pocket of his big coat. It contained milk. Perhaps there was even a tiny, very tiny drop of brandy in the milk. "That will comfort you, you poor kids," he murmured to himself, and insinuated the bottle into the small human mouths. There was some spluttering, but swallowing also. The man gave a quaint little chuckle. "I ought to have been a nursemaid!" he went on murmuring to himself. He waited for a few moments longer, until gradually the cries of "Maman" became more rare, and the two bundles of blankets no longer betrayed any movement through their folds. He went out of the room and gave himself a good stretch. "Sink me!" he muttered, "but I'm stiff. I never thought a woman could hit so hard." This was none other than Sir Percy Blakeney, Bart., the prince of dandies, the enfant gâté of London and Bath society, the brilliant sportsman, and always the smartest and gayest man in town. He said sink me!!! Hurrah! ALSO. I am in a giddy Percy-loving mood right now...I can go a while without reading and still think he's awesome and everything but then I read a Pimpernel novel and am just reminded for the umpteenth time how much I adore this hero and how he's just the bestest!!! Review of Mam'zelle Guillotine hopefully coming fairly soon...it's really a great read and she actually explains away her infamous "for the love of the sport" that we all despise. Plus there's this really sweet bit in a letter to Marguerite that just about rivals The Letter from El Dorado. "On my knees do I beg your forgiveness, my beloved, for the discomfort and suffering you are enduring now. Would I had had the heart not to listen when you said to me: 'If you go, I go with you.' Your eyes, your lips, your lovely arms held me in bonds that no man living should have dared to sever. 'If you love me, do not go,' you entreated, and your exquisite voice broke in an agony of tears. Yet I, like a madman, thought only of two little children who would need a woman's care, and thought more of them and their helpless mother, thought more of an ideal, of my duty and mine honour and of my solemn pledge to Saint-Lucque, more of all that than I did of you. 'If you love me,' you begged, 'do not go.' If I loved you! I love you with my whole soul, with every fibre of my being, more than life and eternity, but I could not love you, dear, so much, loved I not honour more. With the help of my faithful lieutenants I will bring those defenceless women safely to England according to my pledged word, then my arms will close again around you and you will feel my whole soul in a kiss." Ring the Bells on This Joyous Day!!! Soooooooooo I was going about my business browsing through the Internet (whether or not I was watching various videos of Certain People Much Admired on This Blog and By Myself Who Are In the Picture Above shall not be addressed) when I stumbled across something that made me scream like I haven't since the first time I heard the "Sink me, I couldn't agree more" line and realized Percy wasn't dead after all. As most of you know, we discussed last year the possibility of finding out how we could get TSP1982 back on DVD and in circulation. We piddled with ideas but life kind of got in the way and it was dropped at the wayside. I for one can't stop squealing. :) And yes, forget the fact that they spelled tumbels wrong or made Jane's dress blue instead of salmon. 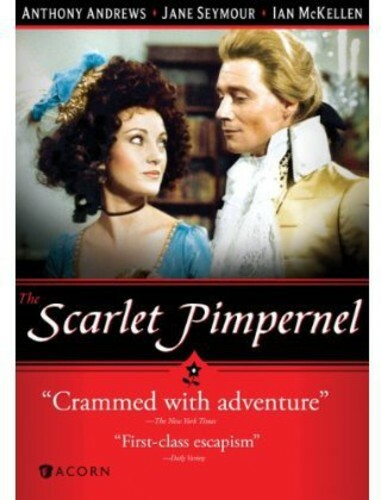 THE SCARLET PIMPERNEL IS COMING BACK ON DVD!!!!!!!!!!!!!!!!! I loved Merle Oberon as Marguerite… she was stunning! From the 1934 movie version. Marguerite is arguably the most conflicted and relatable character in the story. 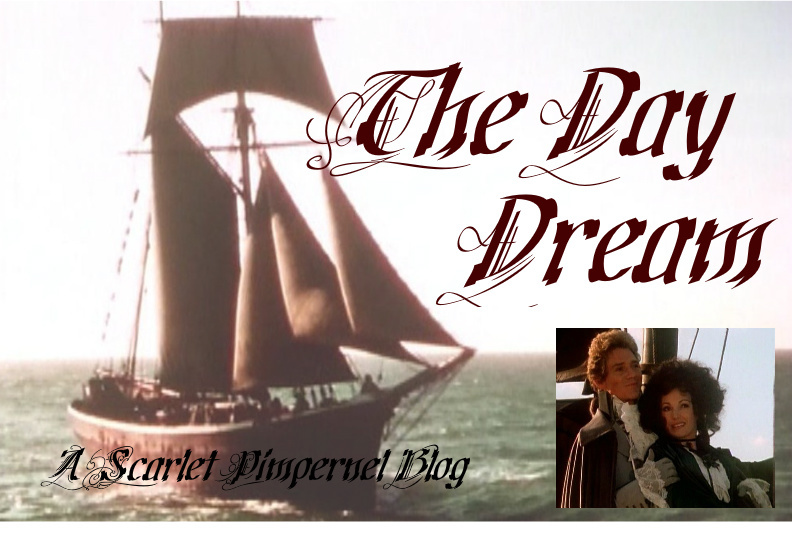 Her terribly rent heart when forced to choose between saving her brother and protecting the Scarlet Pimpernel. The deep love she thought had died toward her husband, yet still flows as strongly as ever through her veins. Her fierce sisterly love and protection for Armand. The most terrible decision she must make, in the short time we are acquainted with her, is the choice between the life of Pimpernel and that of her brother. A man she does not know yet has saved the lives of many others… or her own dear brother? Did she choose wrong, when she chose to give the life of the Pimpernel in exchange for the life of her brother? Whilst she did not see [Chauvelin], there still lingered in her heart of hearts a vague, undefined hope that “something” would occur, something big, enormous, epoch-making, which would shift from her young, weak shoulder this terrible burden of responsibility, of having to choose between two such cruel alternatives. Close upon eleven! The hands of the handsome Louis XV. Clock upon its ormolu bracket seemed to move along with maddening rapidity. Two hours more, and her fate and that of Armand would be sealed. In two hours she must make up her mind whether she will keep the knowledge so cunningly gained to herself, and leave her brother to his fate, or whether she will willfully betray a brave man, whose life was devoted to his fellow-men, who was noble, generous, and above all, unsuspecting. It seemed a horrible thing to do. But then, there was Armand! Armand, too, was noble and brave, Armand, too, was unsuspecting. And Armand loved her, would have willingly trusted his life in her hands, and now, when she could save him from death, she hesitated. Oh! It was monstrous; her brother’s kind, gentle face, so full of love for her, seemed to be looking reproachfully at her. This short time is, perhaps, a defining moment in her life, reflecting such a moment in the lives of the readers as well. What would I do, one is caused to wonder, in the face of such a situation? Would I assist in the certain demise of an innocent man, or would I say no, knowing that another innocent man, my only brother, would certainly be killed in his stead? Jane Seymour as Marguerite was phenomenal and completely gorgeous. From the 1982 movie version. She chooses her brother, we know, though it does not appease her conscience. Little does she know at the time that as she unwillingly betrays the Scarlet Pimpernel, she betrays the very man she loves; heart and soul… her own husband, Percy Blakeney! She finds out soon enough, and just as quick sets out to rescue him from the certain death Chauvelin will deal him. 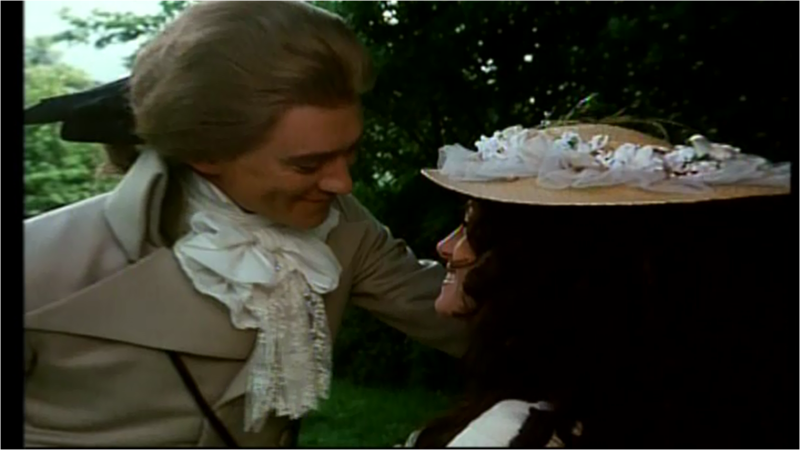 One of the scenes I appreciated the most from the 1982 film adaption (which was not in the book) is when Marguerite sneaks to the library to warn the Scarlet Pimpernel that she has betrayed him to Chauvelin, and the beautiful interchange between them, in which Percy finally realizes her intentions were never to have the Marquis de San Cyr killed, and that she was used, just as she was being used in that moment to save the life of Armand. “You thought I meant to deceive you about it all – that I ought to have spoken before I married you: yet, had you listened, I would have told you that up to the very morning on which St. Cyr went to the guillotine, I was straining every nerve, using every influence I possessed, to save him and his family. She reveals a strength within herself, a strength he had overlooked for so long. She is the woman he’d loved from the start, fiercely loyal, compassionate, willing to take any risks for those she loves. Which she proves twice over in seeking him out after he leaves for the last time, vowing to either save his life, or die with him. And if he failed – if indeed Fate, and Chauvelin, with all the resources at his command, proved too strong for the daring plotter after all – then at least she would be there by his side, to comfort, love and cherish, to cheat death perhaps at the last by making it seem sweet, if they died both together, locked in each other’s arms, with the supreme happiness of knowing that passion had responded to passion, and that all misunderstandings were at an end. Marguerite Blakeney is a woman of strength, of great character. Certainly not without flaws, for none are flawless. Yet, it is through her flaws that we see her as she really is – a woman who, much like any of us, puts the life of her brother and her husband above those of anyone else. She would and does go to any lengths to save the lives of those she can, and especially those dear to her heart. That is Lady Marguerite Blakeney. What do you think of Lady Blakeney? Does her character resound with you?